In case of exports, taxable event occurs when goods cross territorial waters of India - Territorial waters and exclusive economic zone Territorial waters of India extend upto 12 nautical miles inside sea from baseline on coast of India and include any bay, gulf, harbour, creek or tidal river. (1 nautical mile = miles = Kms). Sovereignty of India extends to the territorial waters and to the seabed and subsoil underlying and the air space over the waters. ‘Exclusive economic zone' extends to 200 nautical miles from the base-line. Area beyond that is ‘high seas’. 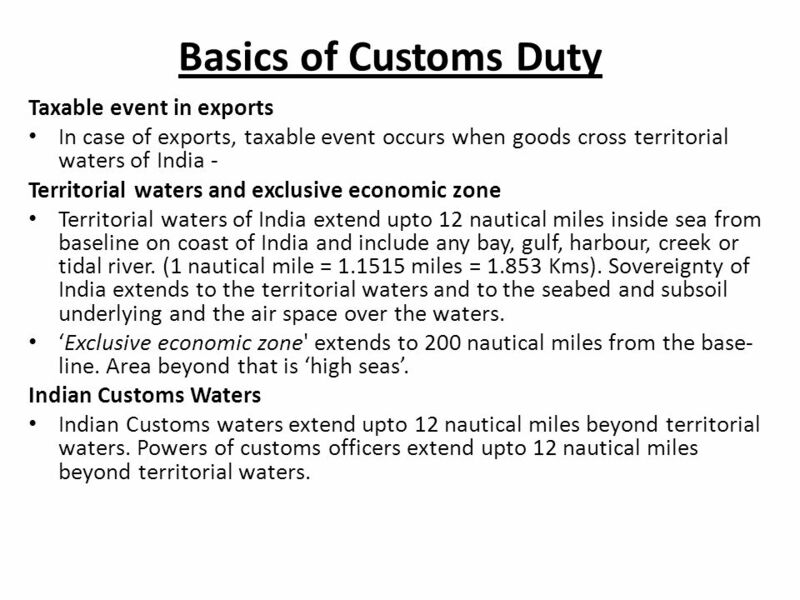 Indian Customs Waters Indian Customs waters extend upto 12 nautical miles beyond territorial waters. Powers of customs officers extend upto 12 nautical miles beyond territorial waters. During the ancient period whenever a trader entered into the boundaries of a country for selling his merchandise, he offered some gifts to the King/Administrator of that country. Later on this practice got converted into the Custom Duty. These days import and export duties are an important source of revenue for all the countries of the world. 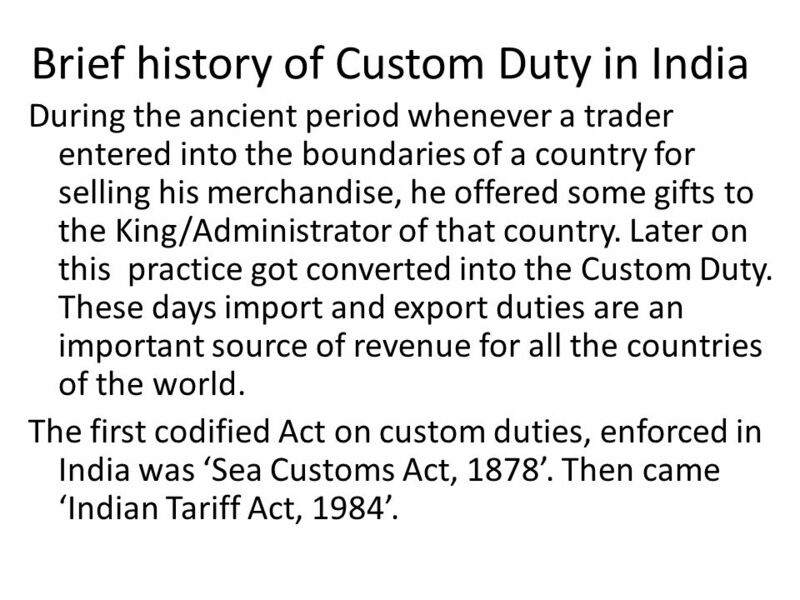 The first codified Act on custom duties, enforced in India was ‘Sea Customs Act, 1878’. Then came ‘Indian Tariff Act, 1984’. 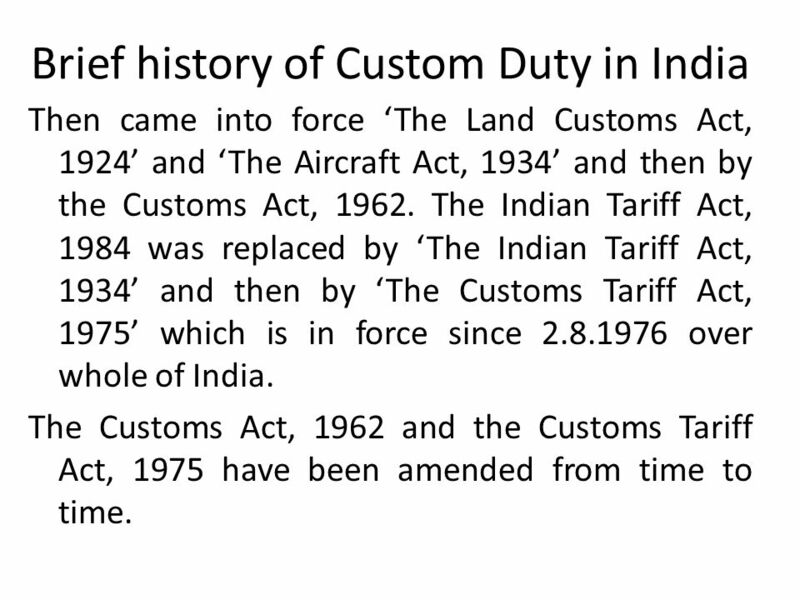 Then came into force ‘The Land Customs Act, 1924’ and ‘The Aircraft Act, 1934’ and then by the Customs Act, The Indian Tariff Act, 1984 was replaced by ‘The Indian Tariff Act, 1934’ and then by ‘The Customs Tariff Act, 1975’ which is in force since over whole of India. The Customs Act, 1962 and the Customs Tariff Act, 1975 have been amended from time to time. 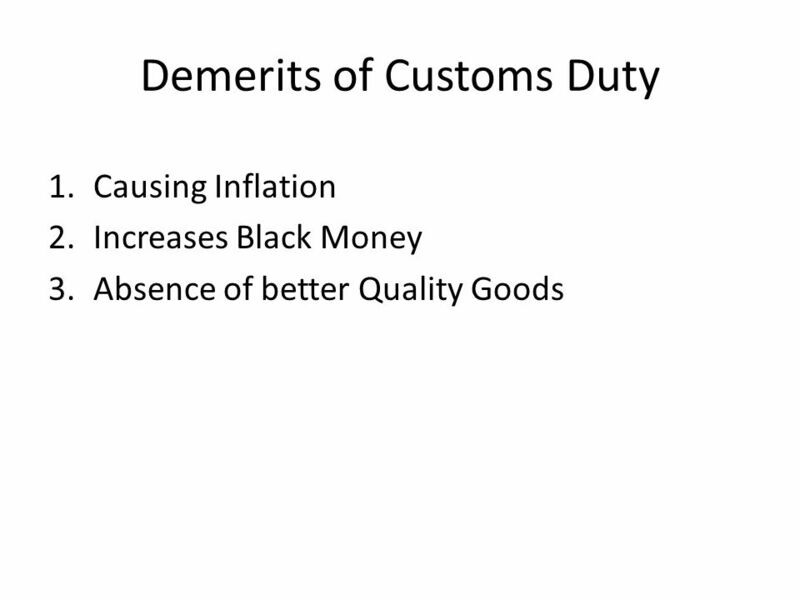 Basic customs duty levied u/s 12 of Customs Act is generally 10% of non-agricultural goods, w.e.f Countervailing Duty (CVD) CVD equal to excise duty is payable on imported goods u/s 3(1) of Customs Tariff Act to counterbalance impact of excise duty on indigenous manufactures, to ensure level paying field. CVD is payable equal to excise duty payable on like articles if produced in India. It is payable at effective rate of excise duty. CVD is payable on assessable value plus basic customs duty. In case of products covered under MRP provisions, CV duty is payable on MRP basis as per section 4A of Central Excise. CVD can be levied only if there is ‘manufacture’. 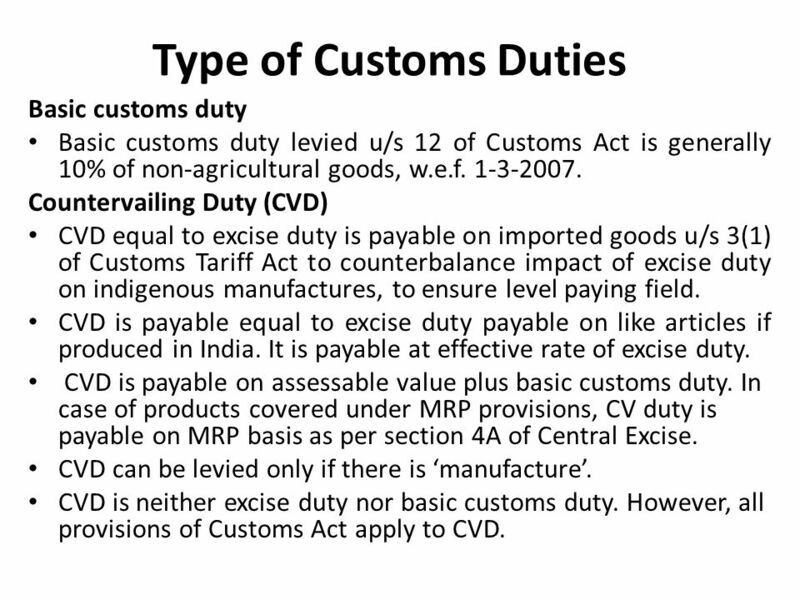 CVD is neither excise duty nor basic customs duty. However, all provisions of Customs Act apply to CVD. 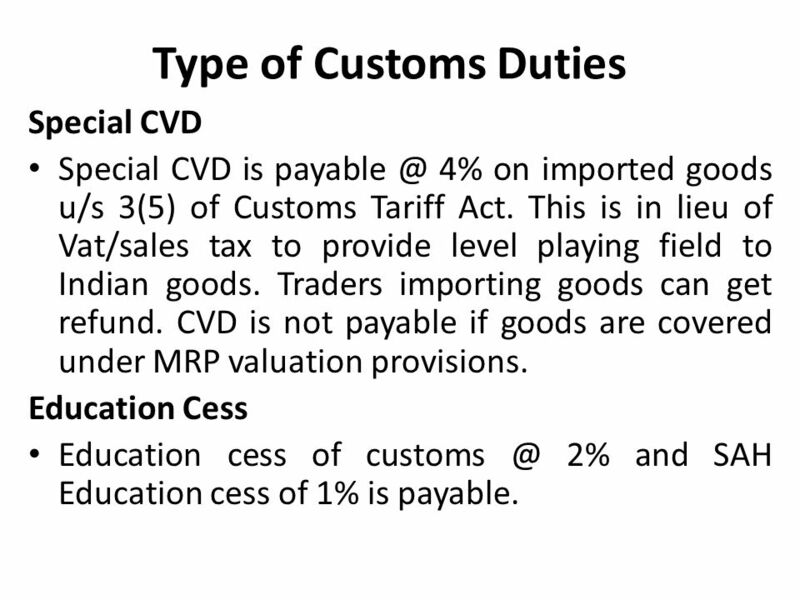 Special CVD is 4% on imported goods u/s 3(5) of Customs Tariff Act. This is in lieu of Vat/sales tax to provide level playing field to Indian goods. Traders importing goods can get refund. CVD is not payable if goods are covered under MRP valuation provisions. Education Cess Education cess of 2% and SAH Education cess of 1% is payable. NCCD has been imposed on a few articles. 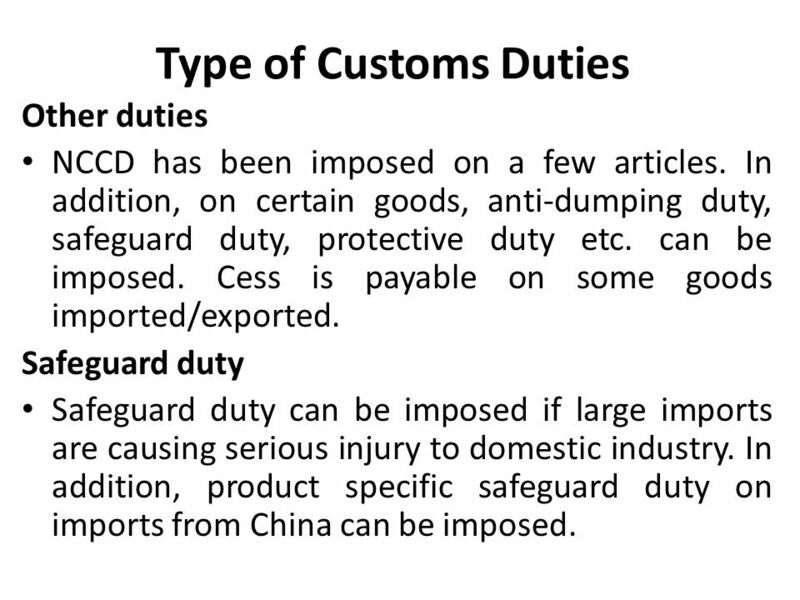 In addition, on certain goods, anti-dumping duty, safeguard duty, protective duty etc. can be imposed. Cess is payable on some goods imported/exported. Safeguard duty Safeguard duty can be imposed if large imports are causing serious injury to domestic industry. 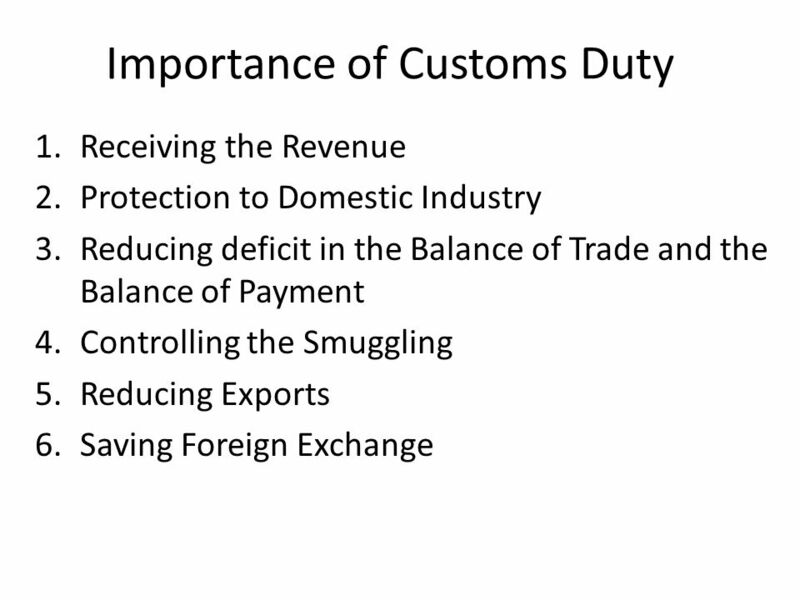 In addition, product specific safeguard duty on imports from China can be imposed. 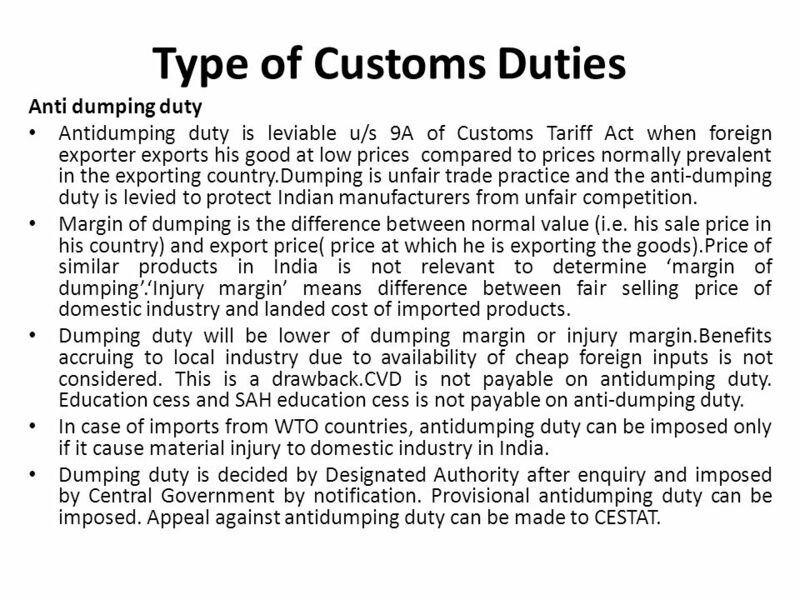 Antidumping duty is leviable u/s 9A of Customs Tariff Act when foreign exporter exports his good at low prices compared to prices normally prevalent in the exporting country.Dumping is unfair trade practice and the anti-dumping duty is levied to protect Indian manufacturers from unfair competition. Margin of dumping is the difference between normal value (i.e. his sale price in his country) and export price( price at which he is exporting the goods).Price of similar products in India is not relevant to determine ‘margin of dumping’.‘Injury margin’ means difference between fair selling price of domestic industry and landed cost of imported products. Dumping duty will be lower of dumping margin or injury margin.Benefits accruing to local industry due to availability of cheap foreign inputs is not considered. This is a drawback.CVD is not payable on antidumping duty. Education cess and SAH education cess is not payable on anti-dumping duty. In case of imports from WTO countries, antidumping duty can be imposed only if it cause material injury to domestic industry in India. Dumping duty is decided by Designated Authority after enquiry and imposed by Central Government by notification. Provisional antidumping duty can be imposed. Appeal against antidumping duty can be made to CESTAT. 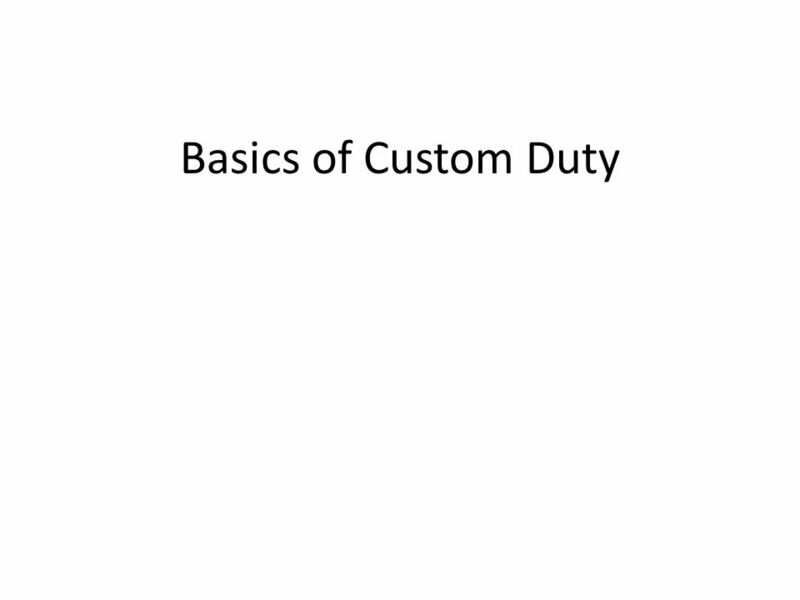 Download ppt "Basics of Custom Duty." Value Added Tax(VAT) is a tax on value added by any economic activity(like manufacturing, retailing etc.) VAT is collected in stages on transactions involving. Commercial Policy and Imperfectly Competitive Markets. Export Regulations. These are sanctioned by governments to regulate exports for a number of reasons amongst which are health, environment and strategic. Price Undertakings Under U.S. Antidumping Duty Law Prepared by Import Administration, U.S. Department of Commerce for the June 2 nd Korea Trade Commission’s. Tariff and Non-tariff barriers, enforcement of WTO rules DG Trade - F3, C. Hallberg. 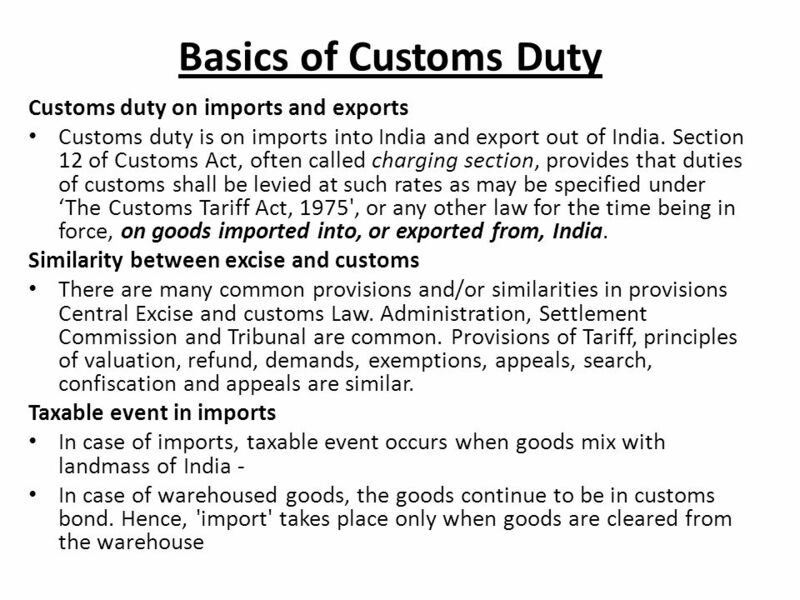 Custom duty is imposed on imports into INDIA and export out of INDIA. The Custom Act was first passed in1962 replacing Sea Customs Act,1878 while the. 1 PRESENTATION ON SUNSET REVIEW: INDIAN PRACTICES By A K Gautam, Director Directorate General of Anti-dumping and Allied Duties Department of Commerce. Import Relief to Domestic Industry. - Free trade - Combating unfairly traded imports (subsidized, dumped in the United States) U.S. Trade Policy. IMPORT means bringing goods into India from a place outside India. EXPORT means taking good out of India to a place outside India. 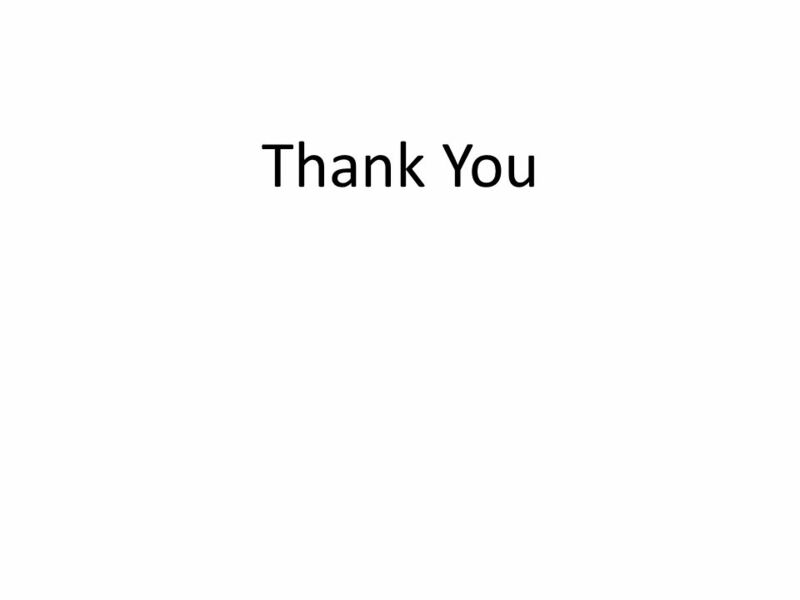 McGraw-Hill/Irwin © 2012 The McGraw-Hill Companies, All Rights Reserved Chapter 11: Pushing Exports.